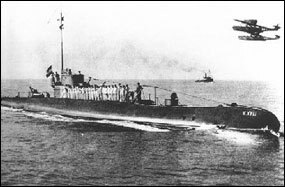 When the Japanese attacked the Netherlands East Indies in December 1941, the Royal Netherlands East Indies Navy had 17 submarines in the theater, three of which were under repair. Far from the “irrelevancy” claimed by the ignorant, these would prove to be extremely effective weapons in resisting the subsequent invasion. In Second World War at Sea: Strike South the Dutch submarines appear in most of the operational scenarios (they’re not present in those concerned with the invasion of the Philippines). Most of the losses inflicted on the Imperial Navy during the campaign came from Dutch torpedoes. The senior submarine skipper, Lt. Cdr. A.J. Bussemaker of O-16, also served as flotilla commander. The submarines were headquartered at the Soerabaya naval base, along with their tender Zuiderkruis. When the Dutch began building submarines in the years before the First World War, they gave them two different designations: O-numbered boats (carrying Arabic numerals) were generally smaller and intended for service in home waters. K-numbered boats (with Roman numerals) were for service aboard, meaning the Dutch East Indies. These subs almost always were larger and had greater range. The split continued until the late 1930s, when the Navy realized it wanted to use the same types on both stations. Starting with O-16 launched in 1936, all Dutch submarines had O-numbers. Dutch naval architects carried a great international reputation, and their well-designed submarines reflected this. Several of the Dutch boats at Soerabaya in 1941 were 20 years old and intended only for training and point defense of the Java base. The striking power came from the five 800-ton boats of the K-XIV class and the similar, larger O-16. Two minelaying submarines, O-19 and O-20, had completed in 1939 and among their other modern innovations were fitted with schnorkel breathing masts allowing them to run their diesels while under water. Highly successful Dutch submarine O-16. When Japan drew the Netherlands into the war, Bussemaker’s O-16 struck back quickly. At Singapore when the attacks began, Bussemaker took his boat along with K-XVII into the South China Sea on December 6th, as soon as the war warning sounded and before the formal declaration, in search of the Japanese invasion fleet believed headed toward Malaya. On the 8th O-16 made an unsuccessful attack on the troop convoy, and two days later she torpedoed a large transport but did not sink it. On the 12th Bussemaker found the submariner’s dream shot: the invasion transports arrayed motionless in the Bay of Soengei Patani. O-16 sank three of them: Tozan Maru (8,666 tons), Asosan Maru (8,812 tons) and Kinka Maru (9,306 tons). Returning to Singapore after this attack, the two Dutch boats ran into a minefield on 21 December. K-XVII exploded and was lost with all hands while O-16 broke in half and sank quickly, with only Seaman Cornelis de Wolf swimming to safety. The war warning sent K-XIV west of Borneo, and on 15 December she received a new skipper, Lt. Cdr. C.A.J van Well Groeneveld. On the 23rd he spotted a Japanese invasion convoy anchored at Kuching and sank the transports Katori Maru (9848 tons) and Hiyoshi Maru (4943 tons), damaged two others and missed a freighter and a destroyer. She had no other successes, heading to Ceylon after Java fell. Van Well transferred to K-XVIII on 4 January and took her to sea two days later. On the night of 23-24 January it was his submarine that sank the Japanese patrol ship Hishi and troop transport Tsuruga Maru (6988 tons) off Balikpapan. Japanese destroyers badly damaged the boat during a subsequent depth-charging, and were still torturing the Dutch sub when four American destroyers burst onto the scene and launched 48 torpedoes at the startled Japanese (this action is depicted in Strike South as Battle Scenario One), sinking three more transports. She also sank a Dutch lightship that had continued to give navigational aid despite the war situation. She was under repair in Soerabaya when the naval yard was evacutaed, and was scuttled there. Lt. Cdr. L.J. Jarman and K-XVI sank the Japanese destroyer Sagiri off Borneo on Christmas Eve, 1941, but was herself torpedoed and sunk by the Japanese submarine I-66 later that day. The modern K-XV damaged a tanker but the older Dutch submarines reported no successes during the campaign. All of them suffered engine problems of one sort or another, though their crews very bravely tried to get them into action. One suffered a battery explosion while operating from Singapore. Minelaying submarine O-19, the first operational sub with a schnorkel device. The two modern minelaying submarines did somewhat better: Lt. Cdr. H.F. Bach-Kolling in O-19 sank the freighters Akita Maru (3817 tons) and Tairu Maru (4994 tons) on 10 January. But O-20 unsuccessfully attacked a Japanese destroyer on 19 December and was hunted by three destroyers until the crew scuttled her off the east coast of Malaya. Strike South’s scenario listings separate O- and K-type submarines; this was an error and all Dutch submarines are of the K-type (numbers are correct). There should also be twice as many listings for them, to allow up to four Dutch submarine flotillas rather than two. In all scenarios where Dutch submarines appear, they receive the Ace Commander die roll modifier for ASW. You can download an updated Dutch submarine hit record for Strike South here. The Strike South hit records have also been updated. And you can order Strike South right now by clicking here.